Adobe Acrobat format, also known as .pdf format, is the preferred format for submitting files for output. This format displays and ouputs consistently from platform to platform and on both Windows, Mac and UNIX Operating Systems. 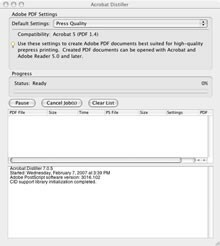 When preparing to create a pdf for submission, we recommend selecting the "Press Quality" option under default settings in either Acrobat Distiller or in the Adobe pdf printer driver. This will ensure that all images in your document print at their full resolution and that all fonts and Pantone colors will be embedded in your in pdf.